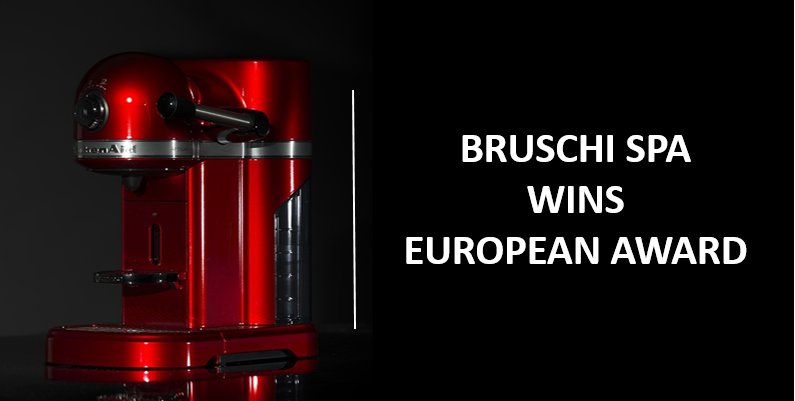 Brescia, Italy (23rd September 2016) — Industrial design and mass production Italian company Bruschi and American home appliance brand KitchenAid have won the prestigious European Zinc Die Casting Competition 2016 for Nespresso KitchenAid Artisan 5KES0503. The project was awarded thanks to the innovative finishing and stunning shapes developed and to an extraordinary zinc die casting process. The cooperation between Bruschi and KitchenAid, in terms of co-design and engineering, was focused on a total quality management approach. Bruschi simulated with MAGMASOFT ® the whole cover to ensure KitchenAid an impeccable result: to minimize risks and develop a mass production process in order to reach customer's needs. Bruschi Vice President & Head of Sales Simone Maggiori said "We are very proud to have won this important award. The project of Nespresso KitchenAid Artisan was an important step for us due to the complexity of components and to the process used to develop this product. The collaboration with the customer, in terms of co-design in die casting, allowed us to reach the expected goals: working from the beginning of the project we can support to develop components, focusing our attention on design and engineering, in order to guarantee the best possible quality with our expertise and our technology. I want to thanks KitchenAid for trusting our company and for their collaboration: this was really a great experience for us. That is the right direction for the future." In today’s competitive global market, customers look for the best performing die castings which meet or even exceed their expectations. The European Zinc Die Casting Competition 2016 provides a unique platform to demonstrate expertise and skills to a broad international audience. Winners will be awarded at the International Zinc Die Casting Conference in Brescia, Italy on September 21-23, 2016. They will be asked to present their work within the conference program, highlighting the main characteristics of the casting and explaining the reasons for choosing zinc alloys. The entries will be judged by an independent jury of experts with no ties to eligible companies. The European Zinc Die Casting Competition 2016 will be organized by the International Zinc Association and will be supported by Initiative Zink (Germany), Zinc Fonderie (France), Assofond (Italy) and TEDFUN (Spain).